Homeblog postBaby feeding set -everything you need to feed your little one! The Tommee Tippee Closer to Nature Essentials Kit is everything you need for when you are ready to start bottle feeding your baby . The award winning “closer to nature bottles” come in two great sizes of 150 ml/5 floz and 260 ml/9 floz, accommodating your baby’s appetite as they grow. As part of the Essentials Kit , you also get the unique teat design that mimics the natural flex, feel and overall movement of a mum’s breast. This design will help with the switch between breast feeding and bottle feeding, making it a much smoother transition! 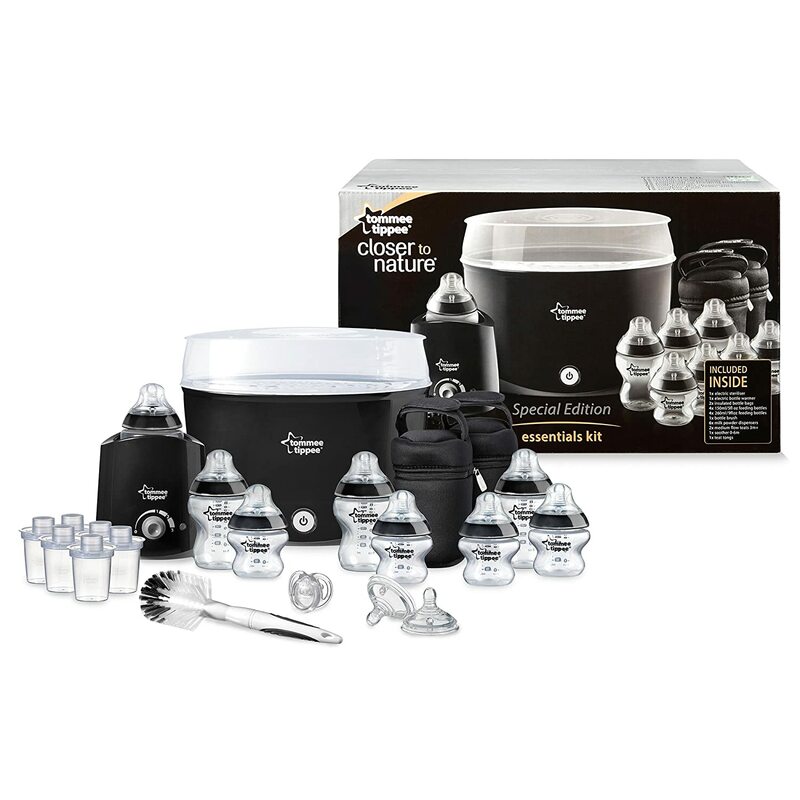 This aesthetically pleasing sterilizer would fit into any home seamlessly like any other essential kitchen appliance and comes with lots of kit which is listed below. The sterilizer is very quick. It only takes 5 mins and you are ready to go. The Tommee Tippee closer to nature bottles are BPA-free for total reassurance. The insulated bottle bags make it so much easier when on the move with the little one, load them up with your milk powder dispensers a warm bottle of boiled water and you are good to go! The steamer holds a handy 6 bottles and is very easy to clean. Everything you need for feeding your baby is at your fingertips with this Closer to Nature Essentials Kit . Some babies may not take to teats. 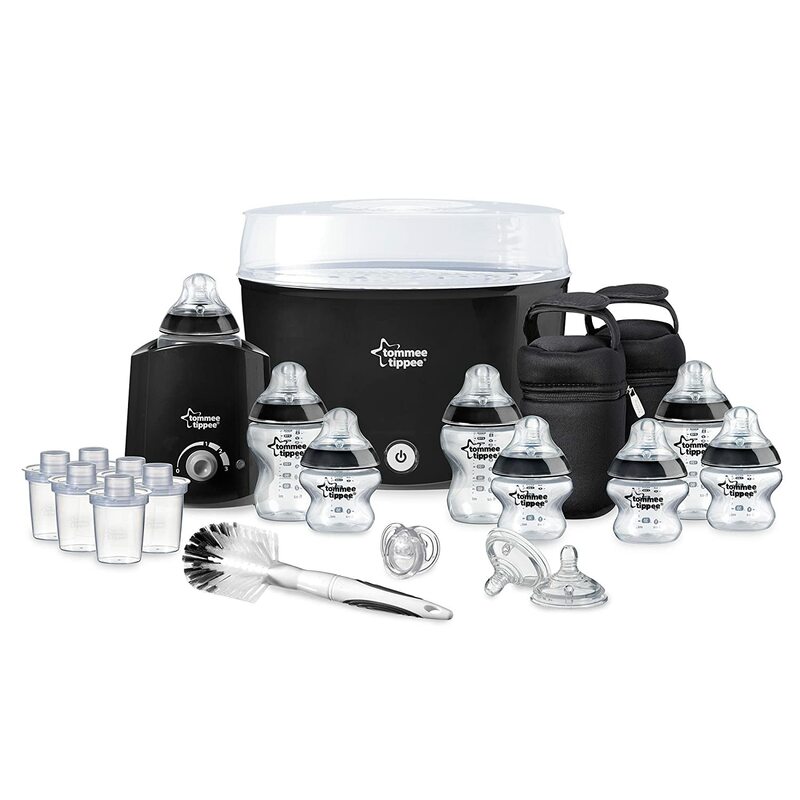 This has everything you need for feeding your newborn and makes it so much easier and hassle free. A very efficient way to prep your little ones bottles – hygienic and simple to use. As a new parent you look for anything that can make life easier, and feeding time can be one of the most stressful. The Closer to Nature Essentials Kit, I believe, gives you that little bit of reassurance and confidence at milky time. A great product made from a well respected & trusted name in the baby world. Tommee Tippee we salute you! If this is the Baby feeding set you want(and we don’t blame you) click the link below and happy feeding time!